Over the last 15 years, automotive engineers have been moving away from chasing power at all costs to better balancing the conflicting demands of power, fuel economy and emissions. Getting as much energy as possible out of the fuel has become a major engineering goal – as it was for the engineers working on an extraordinary engine that first saw the light of day over 60 years ago. The amazing thing is the fuel economy results they then achieved still look excellent today! In the late 1940s a revolutionary new aircraft engine was developed, one that just stunned contemporary engineers. 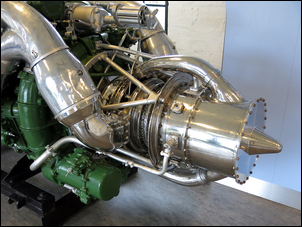 Developed for aircraft, the diesel two-stroke boasted 12 cylinders, a displacement of 41.1 litres – and developed up to 4,100 effective horsepower. And it did this with extraordinarily good fuel economy. That engine was the Napier Nomad. So how did it do it? 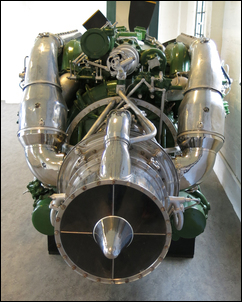 A number of different iterations were tried, but they all involved compounding a two stroke diesel with a compressor / turbine combination. But it was nothing like as simple as just adding a conventional turbo to a diesel! In the first iteration, Nomad 1, an axial compressor, intercooler, centrifugal compressor and two turbines worked with the diesel. The combination drove two contra-rotating propellers using two separate mechanical drives – one for each prop. The photos shown in this story are of the Nomad 1, on display at the National Museum of Flight in Scotland. The engine, incredibly complex even in a time of many complex aircraft piston engines, remained just a prototype. In Nomad II, the design was somewhat simplified - although I am not sure that ‘simplified’ is the right term for what remains a complex engine! 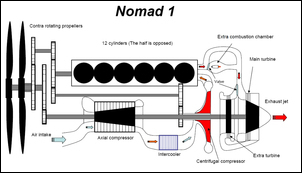 In Nomad II, the 12-cylinder diesel exhaust drove a 3-stage axial turbine. The turbine shaft turned a 12-stage(!) axial flow compressor that supercharged the engine. 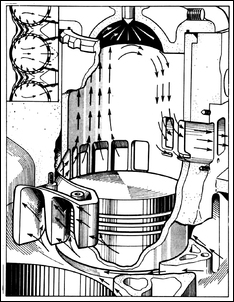 The turbine shaft, however, also mechanically added power to the engine crank. Finally, a little more power was achieved by way of thrust coming from the turbine exhaust. So why go to all this trouble? In two words: fuel economy! Or, more accurately, brake specific fuel consumption (BFSC). BSFC is a measurement of fuel consumption, expressed in terms of pounds of fuel per horsepower hour. And the Nomad II? It could get down as low 0.326 pounds per effective horsepower hour – equivalent to a thermal efficiency of 42 per cent. Well, the Atkinson Cycle petrol engine of the Toyota Prius THS II, a very efficient design, has a thermal efficiency of only 37 per cent. Even current diesels, after a further 60 years of technological advances and electronic control system development, are now in the range of only 40 – 47 per cent. It’s fascinating looking at how the Napier engineers went about the Nomad II’s development. Having dismissed simple spark ignition, compression ignition and turbine engines in their search for ultimate fuel efficiency, they then looked at different ways of combining the strengths of the diesel and turbine. So in what different ways could these engines be combined? 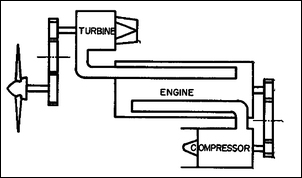 In this approach, all power is taken from the diesel engine, with the diesel driving a turbine that in turns spins a compressor, forcing air into the diesel. This is what we now commonly know as a turbo diesel. However, as we also all know, it’s not possible to perfectly match the turbine to the required compressor airflow – that is, the engine’s requirement. That’s why wastegates are fitted, or more recently, variable geometry turbos. Critically, both of these approaches waste some of the energy contained within the exhaust gas. The engineers at the time said, “… while at full power the turbine can produce power in excess of the compressor’s requirements, at low outputs it cannot satisfy the compressor demands due to the small exhaust energy available from the engine”. Therefore, they concluded, “such an approach is not applicable” to their quest for optimal power and efficiency. In this approach, all power is taken from the turbine – that is, the turbine drives the aircraft’s propeller through reduction gearing. 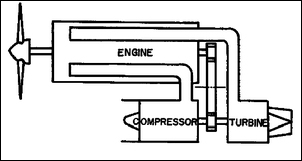 In this design, the diesel engine simply acts as a hot-gas producer for the turbine, and the compressor is used as a supercharger, ie it is mechanically driven from the engine. But the designers didn’t like this approach either. “Firstly, at low power outputs the piston engine is prevented from making the contribution of which it is capable to the total power output, this resulting in very poor thermal efficiencies at part load conditions. 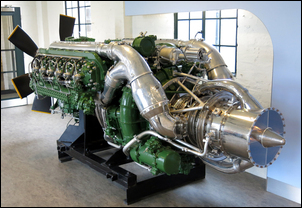 Their final objection to this approach was the necessity for two lots of high-power gearing, one a step-down geartrain connecting the turbine to the propeller, and the other a step-up geartrain connecting the engine to the supercharger. 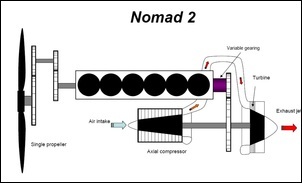 This approach, the one that was adopted for the Nomad II, looks initially like a turbo diesel – the turbine is driven by the diesel’s exhaust gases, the compressor forces air into the diesel, and the diesel directly drives the propeller. However, the addition is the variable ratio gearing system that connects the turbine shaft to the engine’s crankshaft. Now the turbine can be matched to the compressor to provide lots of boost at low load, and at high load the variable ratio coupling can extract power from the turbine shaft, so slowing it and allowing the airflow from the compressor to remained matched to the engine. All without wasting any of the energy contained within the hot exhaust gas. And what did the engineers say about this approach? “In this system no requirement exists for power equilibrium between any two components, and this allows the greatest possible flexibility in the choice of operating conditions for best performance over the whole speed range. But surely a simpler turbo configuration would suffice? So how did all these power flows contribute to the total output – how much work did each bit do? Looking firstly at the diesel alone, at a maximum crank speed of 2050 rpm (remember, it was direct driving a propeller! ), it developed 2660hp – or 1.06hp per cubic inch of displacement. 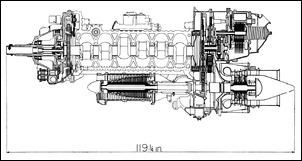 At sea level the turbine developed 2250hp, of which 1840hp was used to drive the compressor, leaving 410hp excess to contribute to the crankshaft output. 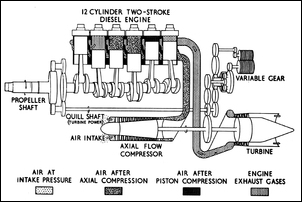 Through the variable ratio gear that connected the turbine to the crank, there was a loss of 20hp, but on the other hand there was also a bit of jet thrust achieved from the turbine exhaust – accounting for these losses and gains, the upshot was an effective 3135hp, or 1.25hp per cubic inch. The engine had a mass of 3580lb (1627kg) which gave it a specific weight of 1.175lb per horsepower. To put that in terms more will be familiar with, at this specific power/weight figure, a 200kg engine would develop about 280kW (375hp)…. with incredibly good specific fuel consumption. But more power was available. By using water injection, the power could be increased to 3580hp (1.43hp per cubic inch) with specific weight a neat 1 pound/hp. In this configuration, specific fuel consumption rose slightly to 0.336 pounds per effective hp hour. What’s that? You want even more power? There was yet another trick up the engineers’ sleeves – inject fuel in front of the turbine and allow it to combust through the spinning blades. In this most powerful configuration, power rose to 4100hp (1.64 hp per cubic inch – from a diesel!) and specific fuel consumption rose to 0.374. Looking at the specific weight figures, it’s obvious that for its power output, the engine was quite light. So how was lightness obtained? The crankcase was a two-piece structure of magnesium alloy castings, and aluminium cylinder blocks were used. The individual cylinder heads were also alloy. However, it’s important to note that the engine mass was quoted ‘dry’, so without oil and coolant. 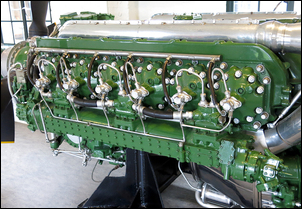 There was no valve gear – the ports (eight inlet and three exhaust per cylinder) were within the cylinder walls. Finally, this amazing engine wasn’t even picky about its fuel. It could run on diesel, kerosene or even some types of petrol. So what happened – why wasn’t this engine widely adopted? Compared with jet-based turbo-props, the Nomad was heavier and larger. Many airline companies immediately dismissed it – American Airlines was typical in their concern about the complexity of the engine. “The Nomad appears to combine the complexities of both aviation piston engines and gas turbines,” they deprecated.